excipients:Lanolin anhydrous – 40g, petrolatum ophtalmic –to 100g. The tetracyclines are mainly bacteriostatic, with a broad spectrum of antimicrobial activity. The following Gram-positive and Gram-negative pathogenic bacteria are usually sensitive to tetracyclines: Staphylococcus aureus, Streptococcus pneumoniae, Listeria spp., Bacillus anthracis, Clostridium spp., Actinomyces israelii; Haemophilus influenzae, Haemophilus ducreyi, Bordetella pertussis, enterobacteria (Escherichia coli, Enterobacter spp., Enterobacter aerogenes, Klebsiella spp., Salmonella spp., Shigella spp., Yersinia pestis, Bartonella bacilliformis, Vibrio cholerae, Vibrio fetus, Rickettsia spp., Borrelia burgdorferi, Brucella spp. Tetracyclines are taken up into sensitive bacterial cells by an active transport process. Once appeared within the cell, they reversibly affiliate to the 30S subunit of the ribosome in bacterial cells. Consequently they prevent the binding of aminoacyl transfer RNA and inhibit the protein synthesis and hence cell growth of. The synthesis of proteins in mammalian cells is also inhibited although tetracyclines. That is why tetracyclines are not actively taken up by bacterial cells, thereby they permit the selective activity against the infecting organisms. The tetracycline as an external dosage form is poorly absorbed from the skeen and has’nt any systematic absorbtion into organism. Thus tetracycline ointment can’t make cause any significant differences in blood plazma. Even in case of long usage level in blood plazma is considerable, but not significant. With the emergence of bacterial resistance and the development of other antibacterials uses of tetracyclines their role has become more restricted in modern medicine, but they remain as the drugs of choice in rickettsial infections, chlamydial infections, trachoma, conjunctivitis, sinusitis and other infections, caused by Chlamydiaceae tracomatis. There are: Chlamydophila pneumoniae (Chlamydia pneumoniae ) Neisseria gonorrheaeae, Staphylococcus aureus, Streptococcus pneumoniae, Streptococcus pyogenes (group A) and mycoplasmal infections. 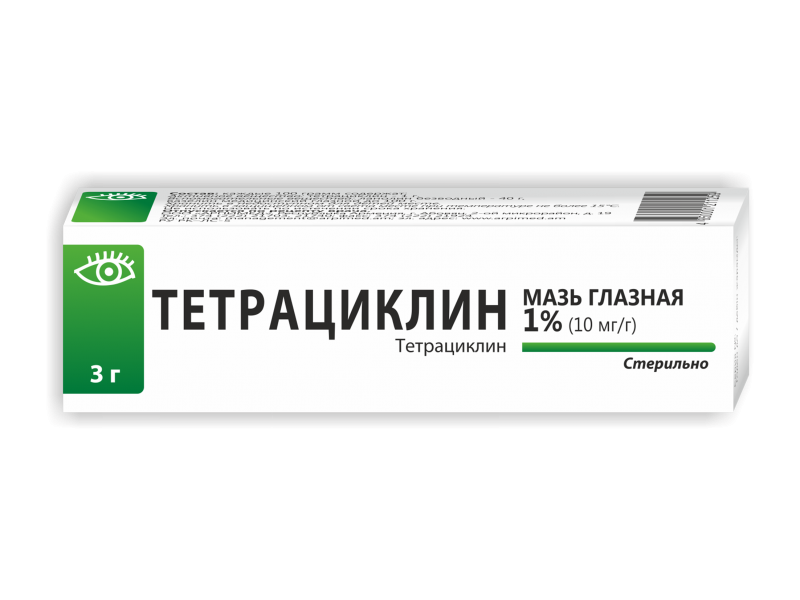 Tetracycline 1% eye ointment is indicated for treatment of superficial ophthalmic infections – and is administered as a topical ointment application to the lid. Blepharitis, blepharoconjuctivitis, bacterial conjunctivitis, bacterial keratoconjuctivitis, trachoma, mieibomitis (irritation of tarsal glands), chlamidia infections.Patient should first wash hands, then pull the lower eyelid away from the eye to form the pouch. The drug should be applied to the conjuctiva (in the putch) as a thin strip (approximately1sm) and gently close eye and keep them closed for a 1-2 minutes to allow the medicine to come into contact with the infection. Such procedure should be done every 3, 4, 6 hours appropriately 3-5 times during the day. To help clears up infection completely, using of drug should be continued even if the symptoms have disappeared. Therapy may be continued for 1 to 2 months or longer in acute and chronic trachoma. Severe infections may also require concurrent oral therapy. Neonatal chlamydial and gonococcal conjunctivitis and uncomplicated bacterial conjunctivitis may be self-limiting but empirical treatment with topical tetracycline antibacterials. In neonatals drug should be applied to the conjuctiva as a thin strip (approximately1sm) as a single daily dose. The tetracyclines are contra-indicated in patients hypersensitive to any of this group of antibacterials, since cross-sensitivity may occur. They are doxycycline, methacycline, monocycline, oxytetracycline. They should be avoided in patients with systemic lupus erythematosus. Severe infections may also require concurent oral therapy for trachoma. Patients who may be exposed to direct sunlight should be warned of the risk of photosensitivity. Care is advisable in patients with myasthenia gravis, who may be at risk of neuromuscular blockade. Blurred vision after administration is expected. If no improvement within a few days the doctor advice is needed. Tetracycline topical ophthalmic ointment has not a systemic action, in rare cases it may cause irritation of the mucosa. Candidiasis, conjunctivitis are possible mainly due to overgrowth with Candida albicans, and there may be overgrowth of resistant coliform organisms, such as Pseudomonas spp. and Proteus spp. Tetracycline has an anti-anabolic effects on eye mucosa. Hypersensitivity to the tetracyclines is much less common than to the beta- lactams antibiotics. Hypersensitivity reactions, including rashes, fixed drug eruptions, exfoliative dermatitis are rare possible as the drug usage is not prolonged. Myopia in patients taking tetracyclines may be due to transient hydration of the lens. The cases of increased muscle weakness in patients with myasthenia gravis and provocation of lupus erythematosus are reported when tetracycline applied for a long time (trachoma). Sensitivity: Tetracycline should be used with caution in persons with known drug sensitivities.Patients allergic to any tetracycline derivatives may have cross sensitivity to just this ophthalmic drug form.Avoid immediate contact with eyes. Pregnant Women: No specific problems have been documented. Pediatrics: No pediatric specific problems have been documented. Geriatrics: No geriatric specific problems have been documented. If the dose is mixed, it should be applied as soon as possible or skipped to other next dose. Allergic reactions are rare and may be manifested by cutaneous lesions, local edema. Topical products that contain propylene glycol may cause skin irritation. Don’t use make up with retinoids when tetracyclines are applied. Ocular inflammation has occurred following the use of ocular preparations preserved with thiomersal in some patients using tetracyclines. Because of possible antagonism of the action of penicillins by predominantly bacteriostatic tetracyclines it has been recommended that the two types of drug should not be used together, especially when a rapid bactericidal action is necessary. 3 g of ointment for local use is filled into collapsed ophthalmic aluminum tubes (inside package). The tubes are packed and inserted with the leaflet into cardboard boxes (outer package). Store in a cool and dry place up at 15°C, out of the reach of children. Protect from light.